We are known for taking a beautiful Pure Muskoka Moment (photo) every single day and posting it to all of our social media accounts (Facebook, Instagram, YouTube and Pinterest). 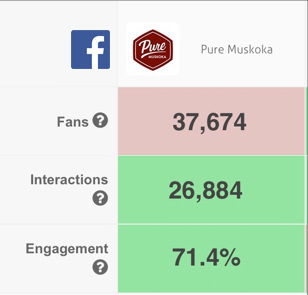 We have Muskoka’s most engaged and enthusiastic audience that eagerly awaits them everyday. Mention (with link if applicable) in each of our social media accounts where we post the photos. Discount available for bulk (5 or more) photos. Check out the screenshot (above) from our analytics. Our engagement rates are off the charts — with over 70% of our fans interacting with us every month.